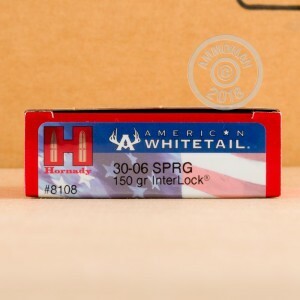 Hornady American Whitetail ammunition is the perfect choice for bringing down deer and other midsize game. 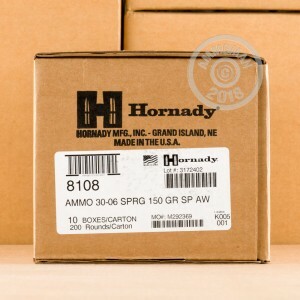 Manufactured in Grand Island, Nebraska, these cartridges come in boxes of 20 and fire a 150 grain soft point bullet at about 2,910 feet per second. The superb long-range accuracy and terminal performance of this ammo makes it much easier to bring down your target at distances well over 300 yards! 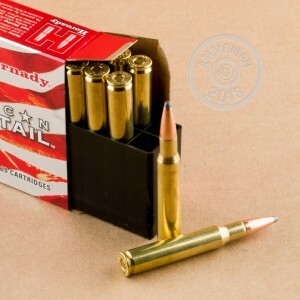 This ammo uses the Interlock soft point bullet, one of Hornady's own designs. The Interlock (as its name suggests) features a locking band that keeps the bullet's core and jacket bound together for maximum killing power against game animals. Remember to take advantage of AmmoMan.com's free shipping promotion with an order of $99 or more. All orders over this amount cost you only the list price!